Western blot analysis of Colo 205 cells treated (+) with combinations of the following treatments as indicated: hydrogen peroxide (500 μM, 5 min), hydrogen peroxide-treated lysates treated with phosphodiesterase 1 (0.5 μg/mL, 4 hr at 37ºC), or with tcPARG (5 μM, 4 hr at 37ºC ) using Poly/Mono-ADP Ribose (E6F6A) Rabbit mAb (upper), or GAPDH (D16H11) XP® Rabbit mAb #5174 (lower). 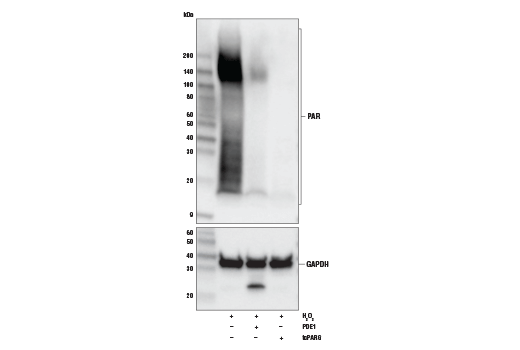 Western blot analysis of Colo 205 cells untreated (-), or treated with hydrogen peroxide (500 μM, 5 min; +), using Poly/Mono-ADP Ribose (E6F6A) Rabbit mAb (upper), or β-Tubulin (9F3) Rabbit mAb #2128 (lower). 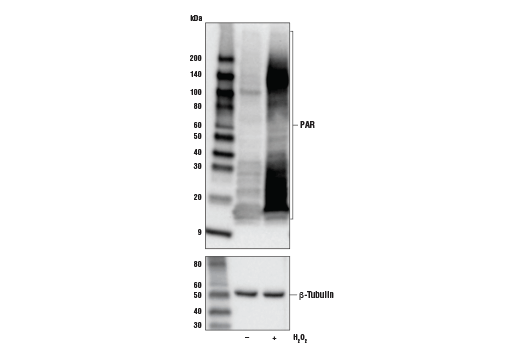 Poly/Mono-ADP Ribose (E6F6A) RmAb recognizes endogenous levels of ADP ribosylated proteins and does not cross-react with other post translational modifications. Monoclonal antibody is produced by immunizing animals with KLH modified on lysines with ADP ribose. ADP-ribosylation is a post-translational modification that has been described to occur on the side chain of several acceptor residues (lysine, arginine, glutamate, aspartate, cysteine, serine) and protein amino termini as well as on DNA and tRNA (1). ADP-ribosyl transferases (ADPRTs) catalyze the transfer of ADP-ribose from β-NAD+ and release nicotinamide in the process. Mono-ADP-ribosyl transferases (MARTs, or monoPARPs) comprise the vast majority of the ADPRTs. These monoenzymes, which include the sirtuins and many of the PARP (ARTD) and ART proteins, transfer a single ADP-ribose unit to the target residue (MARylation). The poly-ADP-ribose polymerases (polyPARPs) or polyenzymes, which include human PARP1, 2, 5a and 5b, are the most widely studied and can polymerize linear or branched chains of up to ~200 ADPR units (2). Specificity is determined primarily, but not exclusively, by a nonconsecutive catalytic triad motif, with some exceptions. Those containing the R-S-E motif like Cholera toxin are arginine-directed transferases, while those containing the H-Y-E triad tend to exhibit polymerase activity (3,4). ADP-ribosylation is reversible and can be degraded down to a single ADP-ribose unit by poly-ADP-ribose glycohydrolase (PARG) or ADP-ribosylhydrolase 3 (ARH3) or completely removed from the target residue by ARH1, TARG1, MacroD1 or MacroD2 (5). ADP-ribosylation is involved in a variety of cellular processes, including mitotic spindle formation, chromatin decondensation, cell stress response, retroviral silencing, RNA biology, and transcription, but the most well-known function of ADP-ribose chains is to serve as a scaffold for recruiting DNA repair proteins that contain PAR-binding modules to sites of DNA damage (6). X-ray repair cross-complementing protein 1 (XRCC1), histone macroH2A1, RNF146 (Iduna) an E3 ubiquitin ligase, and many of the PARPs themselves, among others, contain PAR-binding motifs (PBMs) or domains: WWE, PAR-binding zinc-finger (PBZ), or macrodomains (7). PARylation has a central role in cell survival, and is tightly regulated. PARP deficiency can leave a cell vulnerable to DNA damage-induced apoptosis, while hyper PARylation can lead to parthanatos, a unique form of cell death (8). The role of PARylation in DNA repair has inspired great interest in developing candidate drug inhibitors for PARP, in particular to treat breast, prostate and small cell lung cancers with mutations in DNA repair genes like BRCA1/2, CHK2 or ATM. Stat1, PERK, p53, G-actin and Ras are just a few examples of proteins that are functionally modulated by ADP-ribosylation (6,7). Modification by ADP-ribose can block protein interactions or, in the case of P2X7, cause a conformational change that in the presence of ART2 expression sensitizes naive murine T-cells to extracellular NAD+ leading to apoptosis (9).